The other day I was nominated for the One Lovely Blog Award by Alona from Lone Tester and also Deb from A Pocket Full of Memories. It’s always such a privilege and delight when one’s blogging mates endorse your work. Blogging in some respects is a solitary activity – we research privately (mostly), we contemplate and review what we’ve discovered, and then we put fingers to keyboard to try to bring our stories to life. Comments from our readers and their support encourage us in our solitary pursuits and bring on a warm genea-glow. So, in no way do I want to diminish my thanks to Deb and Alona and others who’ve passed on awards in the past. I am truly pleased that they’ve thought of me and that they enjoy my blog. However what I’ve found in the past is that the awards tend to circulate among a small pool of people perhaps ignoring others, often newbies, who could do with some reader support. After long discussions and some angst back a few years ago, I decided I would gratefully accept the awards but not pass them on in the form intended. Instead I would do my best to visit other blogs and make comments as I think this passes on the love, paying it forward. You can see some of the blogs I follow on my “Blog Links” page under Resources. I read them via Feedly, though sometimes I get waylaid by real life. In the spirit of the award I’ll list the seven things about me you may not know unless you’ve been reading my blog for ages. I am so grateful to my best team supporter, Mr Cassmob. Where would I be without him? Besides which he always finds the graves I’m looking for <smile>. I’m addicted to family history, especially offline research in archives and libraries…it’s kept me sane, and crazy, for nearly 4 decades now. I love cats, especially my gorgeous furry person Springer. I’m addicted to travel as you’ve read on this blog and my Tropical Territory and Travel blog. I’m a true-maroon Queenslander even though I live in the Top End of the NT. A world without books is unimaginable to me…I’m forever grateful to my Dad for passing his book-gene on to me. Visiting Open Gardens each Dry Season has been a great pleasure so it’s sad that this has been the last year it will be held. Surely it almost goes without saying that I love my family because they are my motivation for writing the stories of my families, past and present. If you’re interested you can read what I wrote about my Approach to Awards. Until I did my blog make-over a few weeks ago had it on my menu bar and took it off…Murphy at work again! Thanks again Deb and Alona! This entry was posted in Awards, Blogging and tagged Awards, blogging, one lovely blog award by cassmob. Bookmark the permalink. I agree Anne and will miss them a great deal. When we move to the Sunshine Coast finding open gardens by any name will be a priority. Up here they’re only open in the Dry Season (your winter) so we’re sadly “done and dusted”. 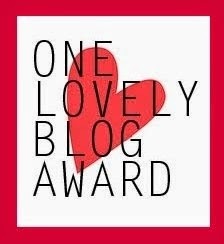 I was also nominated for the one lovely blog award. I will take your thoughts on board and, if I decide to pass it on, will do so as an encouragement to lesser known blogs and bloggers in my loooong list. Jill, I think that’s a good idea especially from you. I can imagine your list looks like War and Peace in length. Thanks Sharon. It’s always a challenge to know what to do.